7 Best Pressure Washer Brands: Whose Products Do You Usually Use? From a brand with a long history to a washer manufacturer offering various types of products, you will know more about their stories with our review. Here we’re going to look at the best pressure washer brands for most people – why they are the best, why and how they are the top companies in the cleaning industry. If you’re worried about whether a pressure washer brand reliable or not, we suggest that you should look for a Briggs & Stratton cleaner. Here are the reasons why. Briggs & Stratton is one of the pioneers in the field, but it only produces gas power cleaners. With over a century of experience in successfully manufacturing and operating, there’s no doubt it is the most reputable brand for now. You can trust their gas devices which will produce tamed power that promote you to be a DIY cleaner to save more money. If you like Briggs & Stratton so far and want their highest-rated models, then these are your best options. There is one feature of almost pressure washer annoying users. That is the engine noise. However, with the Briggs & Stratton Pressure Washer 20680, you will be satisfied with the peace it brings to while admiring your spotless garden. More advantageous, you will not feel any gas smell on the engine during the cleaning process. Featured an 1800 PSI at 1.3 GPM, the product is better for lighter cleaning rather than heavy-duty projects. With at least 2200 PSI, this option is suitable for those who want a more powerful engine compared to the Briggs & Stratton 20680. One attribute making its differentiation is the ability to start quicker that you don’t need to prime or choke it. While almost pressure cleaners require you to follow specific steps to store them, the machine helps you do the job more accessible with a handle that can fold down and rest on the engine. If you plan to do your medium-duty cleaning tasks weekly, then it is an appropriate choice. If you need something which usefully helps you complete a heavy-duty cleaning task like washing a crane, a brick wall, or a tennis court, you’ll be surprised by what a Generac pressure washer could do. Generac has done a fantastic job powering you through any washing job. Their tools will give you more cleaning capacity than other brands. Why? Because they have higher PSI and GPM rates which make quick work of large driveways and flat areas without any damage to the surface. Let’s take a look at Generac’s most surprising pressure washers. The best heavy-duty washer of Generac is the Generac 7019 OneWash unit. Featured 3,100 PSI and 2.4 GPM, it provides users with enormous cleaning power and easy pressure adjustment. It comes with an ergonomic spray gun with integrated power dial that will allow you to do your job easier and faster – even with a light or medium-duty one. The best Generac for most people could be this one because it will make quicker cleaning of large flat areas with an incredible Lithium-Ion battery. It can hold the charge for up to 18 months, equal to providing 50 push starts before needing charging. It also comes with a push button start which is extremely convenient for those having trouble using the recoil pull start – even with a bad back. Karcher provides users with over 130 choices of pressure cleaners and accessories, from professional to home-use ones. Of which, there are 21 electric and 18 gas pressure cleaners. Besides, the brand engineers a list of other cleaning devices such as vacuum cleaners, steam cleaners, or window cleaners, etc. And that’s why Karcher becomes the leading brand in the pressure washer market. That is, they sell all that can clean some of the world’s most iconic buildings, structures, and architecture. Thanks to their resources of engineering, research, and development, Karcher can offer customers at a scale other companies cannot do. Their products may be more costly than those of some brands, but by its high quality, Karcher will cost less in the long run. Also, for its price range, they are the best value for money. And here are the two best Karcher options for you. The product is not only compact and lightweight, but it is also convenient to use with a 5-peace car and home kit. Some people may compare its low rate of 1600 PSI at 1.25 GPM, but its quality and performance depend on different purposes. There’s no doubt this machine is their best home-use option at an affordable price. But that’s not all. The Karcher K2 comes with a highly powerful motor that owns an in-built air cooling mechanism, helping cool down the engine during the task. Featuring a variable pressure dial, the Karcher T300 allows you to control the amount of pressure from tricky to sensitive outers that there’ll be no damage to the surface. It is perfect for use on decks, garage floors, patios, or driveways. Here is one more reason to buy a Karcher T300. Its smart design of a round shape and twin jets together with a joint locking mechanism offering exceptional power and smooth cleaning performance. You might be wondering “Why Owning A Flagup Pressure Washer Is Smart?” Here is the answer. Featuring a high pressure of about 3000 PSI, Flagup’s machines are a useful tool to remove the hardest stain on surfaces. What’s more, their heavy-duty pressure washers also can do light and medium-duty jobs more often and quicker. You only need to use a suitable nozzle and adjust the ideal force for the surface through spray distance. Too convenient, right? So, let’s see what their best pressure washer can do. An induction motor featuring a thermal protector is the first advantage that we want to mention. Not only does it automatically shut off the pump when the trigger isn’t engaged, but it also helps increase the useful life and power of the engine. Also, there are 2 rotating nozzles and robust yet flexible bristles, assuring the outer washed will be under the protection. You can feel the device is somehow massive, but it’s casters will make it easier to move around. Greenworks is a global brand manufacturing electric power pressure washers and some other power tools. There’s no better way to eliminate the dirt on your vehicles, lawn equipment, or patio furniture than with a Greenworks pressure washer. Their products are ideal for light-duty washing jobs and offer 25 times the cleaning power of a garden hose. Their innovation lies in the two-in-one battery that allows users to use two batteries in one casing. Also, they are compact and lightweight, helping do cleaning faster and more convenient. Let’s see how Greenworks pressure washers satisfy customers. What makes it an excellent option for most people who don’t need a heavy or medium-duty unit is its features of 1600 PSI and 1.2 GPM. Moreover, it is quick and effective to clean the surfaces with soap applicator. Also, you can easily extend the hose by 35 feet or upgrade the original one with this pressure washer. The ability to maximize its hose limits is one reason why we suggest the product. As you can see, the Greenworks GPW1501 is very compact, lightweight and it comes in handy, so your light-duty job will be more comfortable and quicker. But, its high-pressure hose is 20 feet long, so you don’t have to keep moving the unit around. More convenient, the different angles of quick tip nozzles in the kit allow you to transform the cleaning ability. With a range of 2000 PSI at 1.5 GPM, AR Blue Clean pressure washers are adequate for professional and home medium cleaning duty. And for sure, there’s no reason why they cannot be used for a light-duty job, just faster. Any AR Blue Clean cleaner can make your driveways, fences, house siding, or wood decks look brand new in 2 hours with its impressive power and a surface cleaner attachment. Have a quick look at the top options of AR Blue Clean. The AR Blue device will make your outdoor cleaning jobs fun and effortless because it’s not necessary to move around your house constantly due to the long hose. Also, it’s easy and quick to connect hose attachments. Compared to the old models of AR Blue Clean, this washer seems to exceed in design and comfortable user experience that it has a stainless lance with quick release nozzles instead of the plastic all-in-one style. I can say that this washer of AR Blue Clean is a high-quality product in the range of medium-duty machine, from its packaging. With shock cushions, the brand assures your device’s protection during the transportation process. This power tool is highly-rated with ease in assembling and using that it comes with full of attachments, from a washer wand, washer gun to washer nozzles, thus making your medium-duty cleaning tasks tireless. Sun Joe is widely known as the best electric power pressure brand for beginners who want to do the garden or lawn cleaning, etc. Of course, all their jobs could be completed using Sun Joe pressure washers. So if you’re looking to invest in a pressure one, then it’ll be your perfect option. Sun Joe offers a high PSI and GPM machine at an affordable price which makes them irresistible to various first-time buyers. Does that make them the best? They have rechargeable batteries. And yes, they are cordless. Those make them more reachable and convenient that users can still wash the surface in case of power outages. So which Sun Joe pressure washers should you buy? 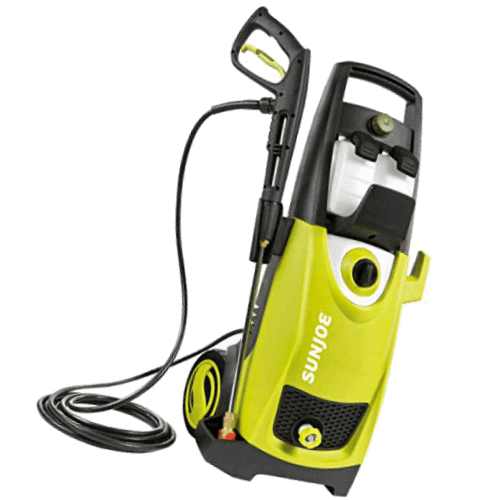 It is one of the most affordable electric power surface cleaners of Sun Joe and offers reliability, power, and style. With 2030 SPI and 1.76 GPM, this product delivers maximum cleaning performance while users still have various choice of nozzles which help go from strong jet to gentle spray in seconds. Both advantages of price and performance have made SPX3000 one of the best-selling electric power washer in the surface cleaning market. If you haven’t gotten used to operating and controlling a pressure washer, the Sun Joe SPX3001 is very suitable for you. It’s safe to say you can trust the machine to continually complete the task without worrying about any surface damage or engine breakdown. Why do we say that? Because Sun Joe company now use state-of-the-art technology to produce their machines, of which the SPX3001 features an Automatic Total Stop System. Not only does it help increase power efficiency by shutting off the pump when there’s no further need but it also prolongs the motor’s useful life. Our list features the highest-rated ones for you based on distinct cleaning purposes and duties. So, you can rest assured that with any brands above, they all worth a try. Please like and share the article if it is useful for you. Thank you.